Please note that a few updates are already in-effect below. Happy New Year from the Dieni Research Group! 2015 was an interesting and inspiring year for us. Here’s a quick look at some of our notable developments over the past 12 months. Our two alumni, Neal Callaghan and Patrick Gormley, have continued to do well following the completion of their undergraduate studies. Among other accomplishments, Neal was awarded Mount Allison University’s only 2015-2016 NSERC-CGS M. He continues his graduate research in the MacCormack Lab, and is currently applying for PhD programs in anticipation of the completion of his master’s degree. Patrick has been working as a technician between the MacCormack Lab, the Westcott Lab, and the Bärlocher Lab, while also serving as a replacement lab coordinator (during maternity leave) for the undergraduate organic and inorganic chemistry lab courses. He has been accepted to graduate studies, as of January 2016, to be jointly supervised by the MacCormack and Westcott labs. There is also word of a possible graduate scholarship for him- more to follow on this as information becomes available. Both of our alumni are doing very well, are are publishing their own papers on their current projects. A particularly notable event this year was Chris’ participation in TEDxCarletonU as one of twelve speakers for the April event. Take a look at Chris’ talk, “Therapeutics, Toxins, and Public Understanding in the 21st Century” below. 2015 was a tricky year for publishing. We were happy to have a manuscript entitled “Cerium oxide nanoparticles exhibit minimal cardiac and cytotoxicity in the freshwater fish Catostomus commersonii” accepted for publication a few weeks ago in Comparative Biochemistry and Physiology Part C: Toxicology and Pharmacology. The article is currently in press and will likely appear as a 2016 publication; we hope to have an electronic version (epub) available in early January an electronic version is already available here. Ideally, we were hoping to have additional accepted publications based on two other manuscripts we submitted in the same time-frame as our cerium oxide manuscript. One of these two manuscripts unfortunately did not fare as well in the peer-review process, but is currently being retooled under Neal’s exemplary tenacity and leadership, and submitted it has already been revised based on feedback received, and submitted to another journal. The other of the two manuscripts, we are sorry to say, has been “under review” for over three months, despite the fact that the journal in question has an advertised 2014 average time to first decision of 6.2 weeks. After three months, needless to say we are hopeful that this manuscript is accepted with minimal revisions requested. Between the two manuscripts in question, a book chapter and an invited review article (more news on these as it becomes available/appropriate), and more to come as ongoing research progresses, we expect that 2016 will be a good year for publishing. Our work continues to be well-received. 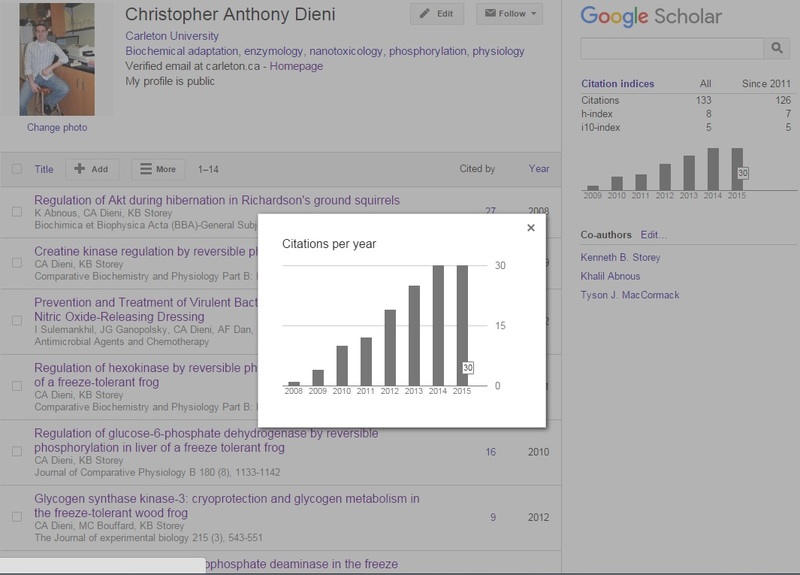 As an example, at the time of this post, Google Scholar Citations lists Chris’ 2015 citations as being on-par with his 2014 citations, each at 30. Of course, there is always shuffling as Google Scholar’s indexing engine continues to search, so this might yet change. In the Fall 2015 semester, Chris was invited to teach Biophysical Techniques and Applications (BIOC 3202) at Carleton University, which he previously taught in the Fall 2014 semester to high praise (an average quantitative score of 4.23/5.00 on his student evaluations of teaching). He was also invited to teach the tutorial section of a new course for him (albeit one for which he previously TA’ed the lab section as a graduate student) over the Winter 2016 semester, Methods in Biochemistry (BIOC 4001); more news on this as the semester progresses. Humblingly, Chris was once again nominated by his students for a teaching award, the 2015 Faculty of Science Excellence in Teaching Awards at Carleton. Regular readers of our website may have noticed that we did not have a news item (i.e. a news post) for this development as it occurred; although Chris was obviously aware of the nominations sent by his students, we waited for an appropriate moment to post the news, however no official response to the nominations was ever received (to our knowledge) from the Faculty of Science or anyone therein. By contrast, when Chris was previously nominated for the 2014 JEA Crake Teaching Award in the Faculty of Science, he received an official letter informing him of the nomination; when another recipient was chosen, he again received a regrets letter informing him of the decision to select another faculty member for the award, but nonetheless celebrating his accomplishments and encouraging him to continue. He received a similar notification of nomination and ultimately a regrets letter a year earlier, when he was nominated for the Mount Allison Students’ Union (MASU) Excellence in Teaching Award. Similar official correspondences were not received regarding the 2015 Faculty of Science Excellence in Teaching Awards at Carleton; however, you can still read the original student nomination letters in the appendices of Chris’ teaching portfolio. Sincere thanks to Anna Koudrina, Jason Moggridge, Cody Thickins, and Waqar Muhammad. In addition to university teaching, Chris also taught college courses in the Biotechnology program at Algonquin College over the Winter 2015 semester. The next few months are going to be busy! With the aforementioned scholarly works in progress (two manuscripts including the one that has been under-review for three months, a book chapter, and an invited review article, plus new findings from ongoing research) there is plenty of writing to be done whenever there is “downtime.” Chris also has ten 4th-year Honours Biochemistry students currently registered in his Methods in Biochemistry (BIOC 4001) tutorial section who are deserving of a high-quality course. Plus, there are several months of research yet to go on the Development Grant. All in all, things show no sign of slowing down anytime soon. Finally, Chris has done well in his fixed-term positions, but continues to seek a tenure-track faculty position so that he can carry forward what he does best. Hopefully, 2016 will be good year in that sense too. Again, Happy New Year and all the best in 2016!